Periodic medical evaluations of disabled patients are imperative for their overall health, especially if they suffer from a chronic disease. However, patients who are wheelchair bound have an added obstacle during a doctor’s visit: standing on a weight scale for an accurate health evaluation is not possible. How can medical personnel precisely calculate a patient’s weight? Enter the wheelchair scale. Arlyn Scales offers state of the art wheelchair scales for the medical industry. Each scale model takes durability, precision, and comfort into consideration; constant use of the scale demands a sturdy construction. Hardy materials, like stainless steel and aluminum, support the weight of the wheelchair and patient. These wheelchair scales use specialized load cells to calculate a precise weight; the load cells were designed to be installed flush against the bottom of the scale’s platform so that the device’s height remains low for comfortable wheelchair accessibility. Surrounding the load cells is a sturdy platform frame which is designed to withstand many years of wheelchair abuse from vibrations and shocks. Typical weight scale displays can be difficult to see in harsh lighting, especially if the numerical features are extremely small. Arlyn Scales has taken this issue to heart; scales offered by Arlyn come with a large display in the center of the grab bar . The displayed numbers are approximately 1 inch tall which allows both the patient and caregiver to have a good view of the weight. How does the wheelchair scale distinguish between the patient’s weight and the chair’s weight? Arlyn Scales has a simple solution: use common wheelchair model weights within the scale’s memory bank. Each wheelchair scale has a database of numerous models and their precise weights. Medical personnel simply need to identify the particular wheelchair being used by the patient and choose that model within the display’s memory. Once the patient steadies the wheelchair on the scale, the display will automatically subtract the chair’s weight from the calculation, leaving an accurate patient weight to remain on the display for documentation. Some medical facilities cannot afford to purchase multiple wheelchair scales. In response, Arlyn Scales has designed a portable version of the basic wheelchair scale. Strong rolling casters allow the scale to be moved easily through a building and the tall display can be folded down to prevent any accidental damage during transport. These scales even use an internal battery so that an external power cord does not become a tripping hazard. One of the most important attributes of a wheelchair scale is a very low profile platform. The scale must include ramps, so that the wheelchair and patient can be easily moved onto the platform. If the scale is low enough, and the ramp has a low slope, many patients may be able to wheel themselves onto the platform. For those who cannot, a low platform makes it easier for an care taker to push the wheelchair onto the scale. Furthermore, the lower the height of the platform, the shorter the ramp will need to be. This will enable the entire footprint of the scale and ramp combination to be as small as possible, conserving space in what may be a crowded location. 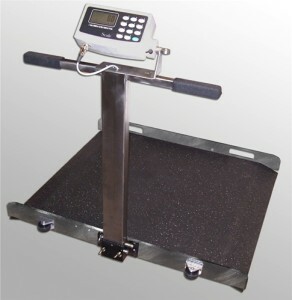 The Arlyn wheelchair scales are among the very lowest available. This is attained by using small, but very rugged load sensor that are constructed from stainless steel. This material allows a higher capacity in a smaller size, while still offering high overload specifications. For the purposes of safety, there may be raised edges on those sides of the platform that are not connected to ramps. This prevents the patient from rolling themselves over an edge, and potentially overturning the chair. It is also easier for an attendant to push the patient onto the scale, as they may not have a clear view of the edges of the platform. The digital indicator should have large, easy to read digits. Often, the user of the scale may not have excellent vision. Or if a helper is with the patient, they may not be able to position themselves close to the scale. The large, high contrast digits on the display are beneficial. Additionally, the scale should be able to display the patient weight in different units, such as pounds or kilograms. For purposes of accuracy, the scale should have good resolution. Preferably, the indicator should show units as small as one tenth of a pound. It is also important that the scale have a high capacity. It will need to accept the weight of a wheelchair, and perhaps a bariatric patient. So capacities as high as eight hundred pounds or more could be useful. Once an accurate weight is obtained, it may be manually recorded in a patients record. But in many cases, it would also be useful to transmit the weight electronically to a computer system. Some methods of data transmission include RS-232, Universal Serial Bus (USB) and Ethernet. RS-232 is a standard that has been used for many years. But the newer personal computers no longer include that type of communication port. USB has become very popular. A few of the higher quality scales, such as Arlyn Scales, do offer this option. That brand also offers an Ethernet port as an option. This allows a very wide variety of equipment to be connected to the data of the scale. Furthermore, it is possible to setup this type of a scale so that the data can be collected remotely, over the Internet. Special software is provided that will take the weight data and enter it into an Excel spreadsheet or an Access database table. From this format, it is easy to produce graphs of weight as compared with time. It is also a good way to compare a patients weight data with the type of treatment they may be receiving, to ensure appropriate results. Where to Find the Best Wheelchair Scales? Many medical providers use computers for patients’ files, rather than the old fashioned manila file folder organization method. Arlyn Scales realizes that weight documentation can be faster if the device is equipped with Bluetooth technology. Medical personnel simply need to send the weight data through the Bluetooth connection to the company’s computer system; weight is accurately documented and the patient can move onto the next evaluation area. Wheelchair scales are constantly evolving with new features and designs. Interested medical providers should Contact Arlyn Scales for more information regarding wheelchair scale purchases.